The reel was part of a rod/reel combo. The reel has not had line on it or been fished with. It may have a minor surface scratch/scuff or two from handling/being in a box with other reels. If you want a nice fishing reel at a low price don't pass this up. TS1XHMB 9 1 6.7 120/12 8.3:1 35". Bowed, lightweight, aluminum reel handle with Lew's® custom paddle handle knobs. TS1SMB features high capacity spool and a longer 95MM power crank handle. Drilled and forged, double anodized aluminum U style spool. Model: MC1SH. The main gear and crankshaft are strong solid brass. The 95mm bowed aluminum handle features oversized Winn Dri-Tac knobs to ensure a no-slip grip in all conditions. The rugged carbon fiber drag system provides up to 20 lbs. From another website, I found that this Baitcast reel features a gear ratio of 4.7:1 and 6 ball bearings. It will hold 155 yds of 20 lb mono line. It has been lightly cleaned and lubed and is spooled with Braided Line. 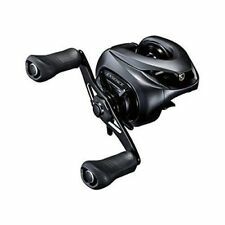 New 2016 Daiwa Tatula CT Baitcast Fishing Reel 100XS Right hand 8.1:1 TACT100XS. The spool starts faster and spins longer. As you start a cast, spool's inductor cup is retracted from the magnets - so there's no magnetic effect to slow the spool. 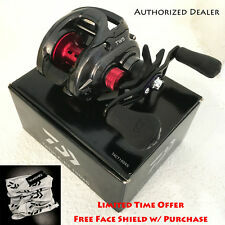 Authorized DAIWA Dealer --- FREE, SUPER FAST SHIPPING!! 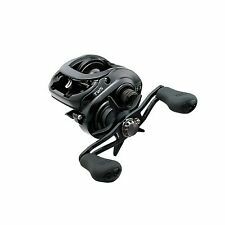 Shimano Calcutta 400D, Right Hand Round Profile Baitcast Fishing Reel CT400D NEW. Condition is New. Shipped with USPS Priority Mail. PERFORMANCE – Low profile design bait caster with low speed 5.3:1 gear ratio and precision cut brass gear for more torque and cranking performance. PROVEN ENDURANCE - 11 1 shielded MaxiDur corrosion resistant ball bearings for super smooth casting, retrieve, and long life. 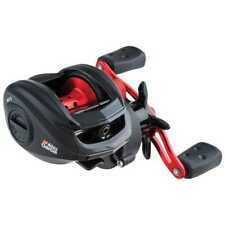 NEW Daiwa Tatula 7.3:1 Right Hand Baitcast Fishing Reel TATULA100HS ON SALE, IT IS NOT the NEW TTU100HS!! TATULA® SERIES. Up front, a unique, hybrid-design levelwind combines the durability of a standard levelwind with the casting performance of Daiwa'sT-Wing aperture. LEW'S XFINITY Right Hand Baitcasting Reel 7.5:1 Gears 8 Bearings. Shipped with USPS. Reels are brand new. No box no paperwork on used. Your new favorite casting reel is here! The Shimano SLX Low-Profile Casting Reel combines a compact body with a deep spool. The SLX Reel is 20% smaller than the Shimano Caenan reel, making it easier for you to palm. SPECIFICATIONS: Retrieve: Right | Gear Ratio: 7.5:1 | Capacity(yd/lb): 110/12 | LPT: 30" | Bearings: 10 1 | Weight(oz): 5.4 | MPN: TLH1SH. Built on the exclusive SLP Super Low Profile platform, which is Lew's lowest profile design. NEW TATULA. TATULA SV TW's SV SPOOL is made of Super Duralumin which is lighter but has great strength. TASV 103XSL M / L 7(2CRBB) 1 8.1:1 32.8” 7.2 14/100, 16/90 13.2 LEFT. 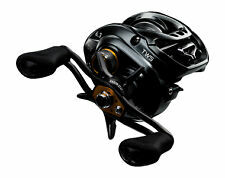 Daiwa's T-wing System solves an age old problem with baitcasting reel levelwind systems. TS1HMB 9 1 6.7 120/12 6.8:1 28". Bowed, lightweight, aluminum reel handle with Lew's® custom paddle handle knobs. TS1SMB features high capacity spool and a longer 95MM power crank handle. Drilled and forged, double anodized aluminum U style spool. 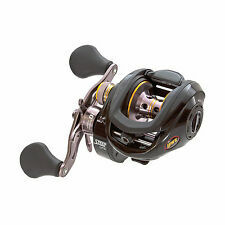 ABU GARCIA Blackmax3 Low Profile right-handed Baitcasting Reel. 5 Ball bearings. 4 stainless steel ball bearings and 1 roller bearing. Retrieve Per Turn: 26in. Graphite sideplates. Gear ratio : 6.4:1. 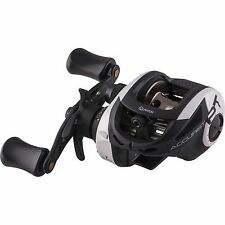 4.5 out of 5 stars - ABU GARCIA Blackmax3 Low Profile right-handed Baitcasting Reel. 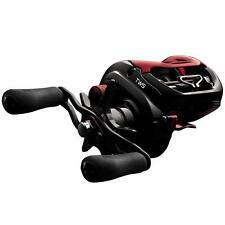 3 product ratings3 product ratings - ABU GARCIA Blackmax3 Low Profile right-handed Baitcasting Reel. Lew's Custom Inshore Speed Spool. Lew’s combat grip pad on thumb bar. Price is for one reel. Be sure to see our other Lew's reels and all of the products sold at JBC Outfitters! Speed - 7.5:1 Retrieve Speed. Lew’s Mach II Baitcast raises the bar in looks and performance of a quality baitcast reel. Machined and double-anodized 32mm aluminum U-shaped spool. Durable Rulon drag system, provides up to 15 lb drag power. 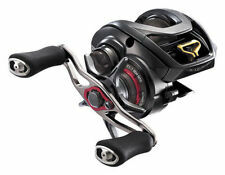 Daiwa's T-wing System solves an age old problem with baitcasting reel levelwind systems. The "T" aperture allos line to flow freely through the wide top section on outcast, reducing the normally sharp angles and friction that slow line flowing through a narrow aperture when exiting the reel. Shimano SLX 150HG. Condition is New. Shipped with USPS First Class Package. TS1SMB features high capacity spool and a longer 95MM power crank handle. TS1SMB 9 1 6.7 150/12 5.6:1 23". Bowed, lightweight, aluminum reel handle with Lew's® custom paddle handle knobs. Drilled and forged, double anodized aluminum U style spool. FGCT100HL M / L 5BB, 1RB 6.3:1 26.3" 7.9 MONO: 14/120, 16/100 13.2. 2017 FUEGO CT line of baitcasters feature an all new lower profile design that is as good looking as it is comfortable to fish. Fuego CT Baitcasting Reels. Lews Mach 1 used only a couple times. Still in new condition. I will leave it spooled with 50lb power pro. I do not have the original box. TLCP1SH 10 1 5.8 110/12 7.5:1 30". Built on Lew’s new and exclusive SLP Super Low Profile platform, making it compact, powerful and loaded. It is Lew’s lowest profile design ever, weighs only 5.8 ounces, sits super low in the reel seat and provides unmatched balance. FGCT100XS M / L 5BB, 1RB 8.1:1 33.9" 7.9 MONO: 14/120, 16/100 13.2. 2017 FUEGO CT line of baitcasters feature an all new lower profile design that is as good looking as it is comfortable to fish. Fuego CT Baitcasting Reels. TLL1SH 10 1 5.7 120/12 7.5:1 31". Bowed lightweight 85MM carbon fiber handle with Lew's® custom EVA foam cork lightweight handle knobs. Aircraft-grade Duralumin drilled U shape spool, drive gear, crank shaft, and crank shaft. These baitcasting reels are available from many different brands, including Abu Garcia, Ambassadeur, Bass Pro Shops, Shimano, Daiwa, Tatula, and Field & Stream. When selecting one of these reels, there are also a large number of features that you can consider, such as the inclusion of an aluminum spool or a line counter. 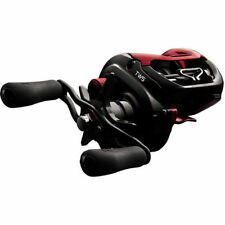 What are some features of baitcasting fishing reels? Aluminum spool: The inclusion of an aluminum spool in many of these baitcasting reels allows the reel to withstand wear and tear. Line counters: Some spinning reel models are classified as line counter reels, which allows you to measure how much line you have put out after casting. Recoil eliminator: The recoil eliminator feature will help you keep your rod steady when casting and reeling in a fish. Many come with a low-profile design that is more ergonomic and user-friendly. What situations can baitcasting reels be used in? Some of the additional features that may assist you when fishing include enhanced oscillation systems, enhanced gear trains, a gear support system, an enhanced cutting tolerance, and an anti-reverse feature. Some spinning reels also have power assist. In some cases, you can select a reel that is made for left-handed or right-handed people. A baitcasting reel may be able to be used in situations where precision and accuracy are needed. When you are considering casting lures such as spinner baits and jigs, a baitcast reel allows you to do so without suffering from inaccurate casting. As the line flows off of this type of spinning reel, you will need to thumb the spool in order to make sure that the line drops where you want it to. 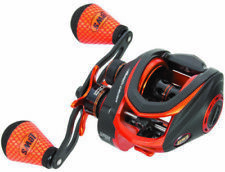 What does the gear ratio of a baitcasting reel mean? Due to how this type of reel is created, it is possible for you to send a line further than you might otherwise be able to, as the line flies directly off the fishing reel's spool. As you become experienced in using a baitcasting reel, you will invariably become more accurate and precise when casting. Although a baitcasting reel can be used in almost any situation when fishing, they are often designed to be used in situations that require precision. When searching for a baitcast reel, you will notice that many are listed as having a specific gear ratio. The gear ratio of a reel basically refers to the speed at which you can retrieve the reel's line. The importance of a gear ratio is determined by what type of fishing you are doing. 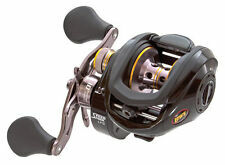 A slow reel speed is one that is listed at 5:1, while a medium reel speed is usually anything around 6:1. Speeds of 7:1 or above are considered to be fast and are typically used to quickly catch up to a fish once you have it hooked. Slower gear ratios allow you to feel everything that is going on with the reel.